Here, five fantastic sandwiches that will boost your Super Bowl party—no matter which team is winning. 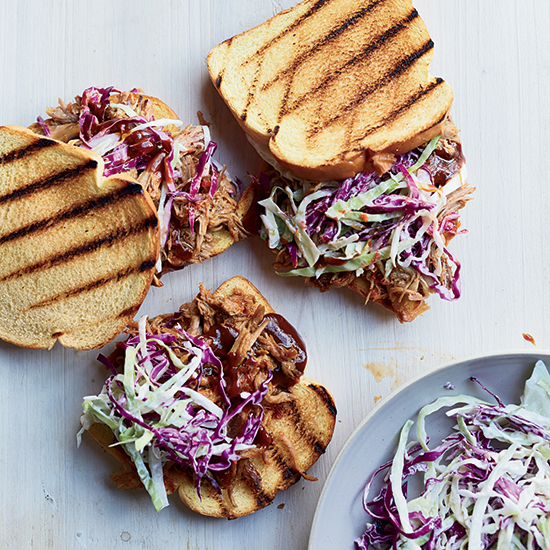 It's impossible to be sad when there's pulled pork around. Here, five fantastic sandwiches that will boost your Super Bowl party—no matter which team is winning. Roasted garlic seasons this pork shoulder, which slow-cooks until tender and deeply flavorful. Star chef Tim Love overstuffs his quesadillas with delectable braised pork and sautéed onions and peppers, then goes (almost) over the top by smearing the tortillas with soft, tangy goat cheese. Mound this pulled pork on hamburger buns and top with coleslaw, thinly sliced onion and dill pickles. Chef Linton Hopkins turns this slow-roasted pork shoulder into sliders and serves them with sunchoke pickle relish and Aunt Julia’s Barbecue Sauce. New York City chef David Chang likes eating these vinegary, spicy sandwiches late at night with a mint julep.